Silver Giant Barbecues are Your Most Powerful Choice in Gourmet Cooking, with features that will please home cooks and satisfy barbecuing professionals. 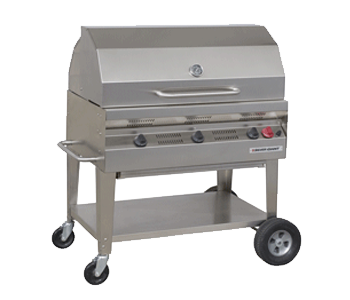 Silver Giant barbecues come standard with stainless steel cooking grids and burners, easy-cleaning removable grease trays, a crossover ignition system to ensure reliable lighting every time, optional heavy-duty smoke hoods with stay-cool handle and semi-pneumatic wheels with locking castors. Available models include commercial and residential barbecues, built-ins, inferno charcoal grills and accessories. And don't forget our customizable Barbecue Trailers, which are so convenient, with built-in affordable grilling mobility. The Silver Giant SGC-36 having three burners and 216 square inches of cooking surface more then the SGR-24, will satisfy the appetites of larger groups and families. Built for the outdoor chef who demands the flexibility of a large cooking area, the SGC-36 delivers just that.